Swans are very large waterbirds. 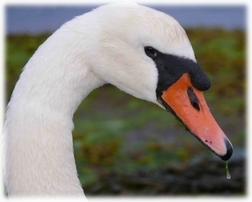 Two of the three swans on the UK list can be seen in Arran in the winter, the Mute Swan and the Whooper Swan. It is fairly easy to tell them apart. The Mute Swan has a long S-shaped neck, and an orange bill with black at the base of it. 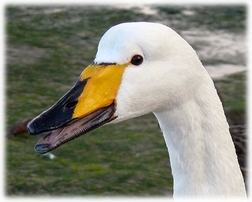 The Whooper Swan also has a long thin neck, which it usually holds erect. Its black bill has a large triangular patch of yellow on it. The difference in the beak between the two species is a distinguishing feature. In addition, the Mute Swan tends to be silent ,whereas the Whooper Swan has a loud ‘whoop-whoop’ trumpet-like call. The Mute Swans are resident and are here all the year round. At one stage from 1980 until the early nineties, there was only one pair of Mute Swans in Arran, and they were based in Lochranza . These were not successful in breeding. However,in 1995 a pair bred near the fish farm at Kings Cross. This was the first breeding record since before the Second World War. From 1995 the population has increased. In 2006, there was breeding reported from Corrie. Sannox, Clauchlands, Lamlash, Whiting Bay, Kildonan, Cleat, Blackwaterfoot, Machriewaterfoot, Catacol, and Lochranza, with seven pairs reported between Blackwaterfoot and Lochranza on 17 August 2006. Some birds stay in their territories all year, while others move short distances and form winter flocks. The Whooper Swans are winter visitors to the UK from Iceland. In October 2006, groups of between fifteen and forty passed through and were reported from Pirnmill, Shiskine, Cleat and Kildonan. A small group joined the Mute Swans in Whiting Bay for the winter. There is no doubt that the “feeding station” in Whiting Bay has been beneficial to the swans of both species particularly in the winter.